The 2012 London Olympics has been making news right now as teams and athletes prepare in their pursuit of the coveted Olympic gold medal. Jordan Brand is set to go with the flow with the release of their “Olympic Gold Medal Pack”, which includes an Air Jordan 6. 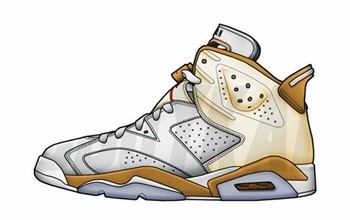 No official image of the actual shoe has been released, but sketches came out showing that the Air Jordan 6 “Gold Medal” is made up with a cream-colored upper part accented with gold touches all throughout the shoe. Make sure to keep yourself updated so you won’t miss this special release from Jordan Brand! Air Jordan 1 Phat GS Valentine’s Day Edition Out!